This guide is for the MSX game. For other games in the Alien series, see the Alien category. Developed and published by SquareSoft in 1987, Aliens is based on the 1986 film Aliens. The game was released only in Japan for the MSX. 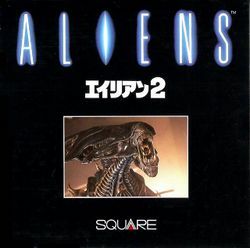 On the packaging, the title of the movie appears in English and the title of the game, which translates to "Alien 2", appears in Japanese. Ripley is alone on an inhospitable planet, and must clear it of aliens and snakes. Starting out with just a basic gun, she must find valuable upgrades to help her exterminate the alien population first on the surface, then in an underground complex. This page was last edited on 1 August 2011, at 03:46.